When an exhibition center stretches 75,000 square feet and hosts huge international events as varied as the Senior Fair, Chocolate and Baking Festival, and Housing Fair, a robust, expandable, and powerful wireless audio system is essential. For this task, the Stockholm International Fairs and Congress Centre in Sweden chose the Axient Digital Wireless System from Shure. Designed to handle the wireless audio demands of a wide range applications and settings held at Stockholmsmassan, this system ensures that no matter where attendees roam, they are able to clearly hear presentations, music… any type of audio production that’s thrown onto the Axient microphones. The reliability and flexibility of the system is particularly important for events like the world-renowned Medical Congress, which attracts more than 15,000 medical professionals during a three-day period. Key features that sold Stockholmsmassan on the Shure Axient Digital Wireless System was its reliability and range. Even when 68 channels are employed—to be expanded next year to 120 channels—the system performs with low latency (2 milliseconds from microphone transducer to analog output), battery life, and versatile channel bandwidth. 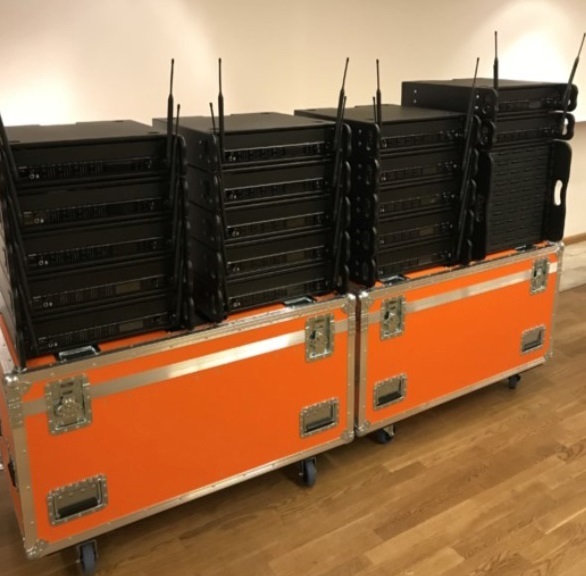 “This month, we will use 132 systems for a two-day corporate event, with a total of 212 wireless systems in operation, which will showcase the system’s flexibility and reliability,” says Fredrik Zetterberg, head of production event technologies, Stockholmsmassan. The flexibility of the system enables it to serve the wireless audio needs of all types of conferences, of all sizes, as well as a wide variety of exhibitions. So far, the Axient Digital Wireless system has “exceeded all expectations in sonic quality,” Zetterberg continues. Helpful to the A/V engineers at Stockholmsmassan is the Wireless Workbench software suite. With so many wireless channels competing for bandwidth, the software enables engineers to prepare configurations prior to the event and monitor and manage the audio remotely from their laptop. The audio rental company that managed the installation of the Axient system, Parashoot, was equally impressed with the capabilities of the system.